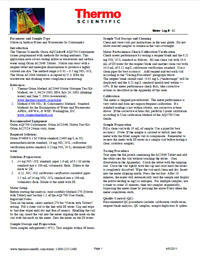 The Thermo Scientific Orion AQUAfast® AQ3700 Colorimeter comes programmed with methods for testing nutrients. This application note covers testing nitrite in wastewater and surface water using Orion AC2046 Tablets. Nitrite ions react with a reagent tablet and undergoe diazotization to produce a highly colored azo dye. The method range is 0.01 – 0.5 mg NO2-N/L. The Orion AC2046 Method is accepted by U.S. EPA for wastewater and drinking water compliance monitoring.